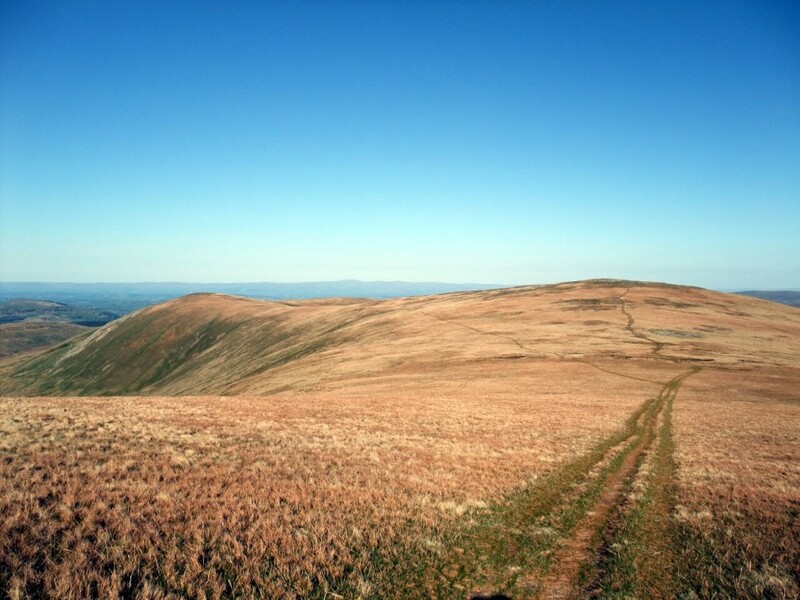 I’m going to say something that I don’t believe many people say: some of my favourite hills in the English Lake District are the rolling grassy bogland hillsides of its northern fells. 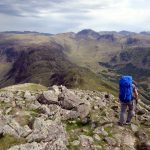 There are some impressive looking mountains in the Lake District, carved into dramatic rock formations by the action of glaciers during the last Ice Age. Anyone who has climbed Scafell Pike, the highest mountain in England, will have looked across the deep chasm of Mickledore (a name which for some reason reminds me of Tolkien’s Lord of the Rings) to its sister mountain Sca Fell. A little east of this the rugged outcrops of Langdale Pikes stand sentinel on lofty crags above the beautiful valley of Langdale. And the goal of legions of hillwalkers for generations has been Helvellyn via the exposed airy ridge of Striding Edge, an easy scramble if it’s not too windy, but not a place to put a wrong foot. With this treasure trove of dramatic scenery to choose from, why would anyone say they prefer gentle rolling hillsides of boggy tussock grass? Because they’re the nearest thing you can get to true wilderness in one of the most crowded touristy parts of Britain. And because, being right on the edge of the Cumbrian highlands, they command by far the widest views, right across the Solway Firth to Dumfries and Galloway north of the border, and east to the line of distant hills that are the high Pennines. A few years ago I remember spending a couple of days backpacking with a friend in the area north of Skiddaw and Blencathra on a busy Easter bank holiday weekend. At least it was busy on these two popular peaks, but once we’d passed over Skiddaw’s windy summit into the rolling hillsides beyond we saw barely another human being for 24 hours. 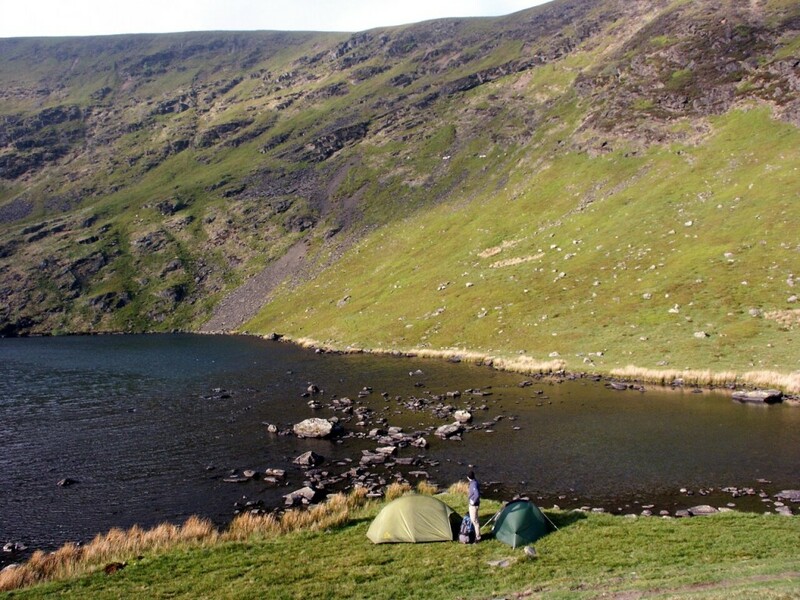 We camped wild beside Bowscale Tarn, a little lake high above a dale looking across to Carrock Fell. Above the tarn was a steep cliff face, the first we’d seen in this otherwise gentle landscape, so that it seemed the tarn and its bowl had been scooped out of the rolling hillside by the hand of a giant. A more idyllic spot could hardly be found to camp anywhere in the UK, and yet there were hordes of bank holiday tourists just over the hill. I was reminded of these hills and the contrast with their neighbours last weekend, when I escaped Royal Wedding fever at home in London by heading north to help my father celebrate his 70th birthday among our most picturesque landscape. We climbed Fairfield together on the Saturday, a huge plateau of a mountain which has the distinction of standing more or less slap bang in the middle of the Lake District, so that you can see all of the main Cumbrian hills from its summit (when it’s not clouded over in mist as it often is, of course). 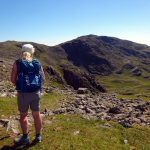 We ascended via St Sunday Crag which looks straight across Grisedale to Helvellyn and Striding Edge, and we could see dozens of tiny figures crawling along the ridge. Dad won’t usually walk anywhere without stopping in a pub for lunch. This time he overcame this particular hurdle by opening up his rucksack on the summit and producing four bottles of Cornish Skinners lager. Then on the Sunday after toasting the old man’s three score years and ten at the pub in Dockray for lunch, I strode up Matterdale Common on my own to Great Dodd, Watson’s Dodd and Stybarrow Dodd. These three great hillsides back onto Helvellyn from the north, but couldn’t be more different. 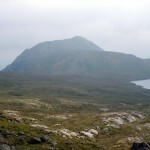 There are no dramatic crags here: these hills very much resemble their northern neighbours in character, just featureless rolling boggy hillsides connected by broad grassy ridges. They would be tricky to navigate in thick mist, but now I could see for miles and miles and miles, and I was all alone, a moment to savour amid the hurly burly of modern life. The solitude was perhaps fortunate, for it was incredibly windy on top of Great Dodd, so windy that standing up was somewhat difficult, though not quite as difficult as trying to pee up there. With nowhere to shelter from the wind this proved to be an interesting experience, and potentially hilarious had anyone been watching. Talk about dispersing it to the wind. I continued onwards along the roof of the world. Eventually I caught up with a single solitary lady walker, who appeared anxious and asked me where I was heading. 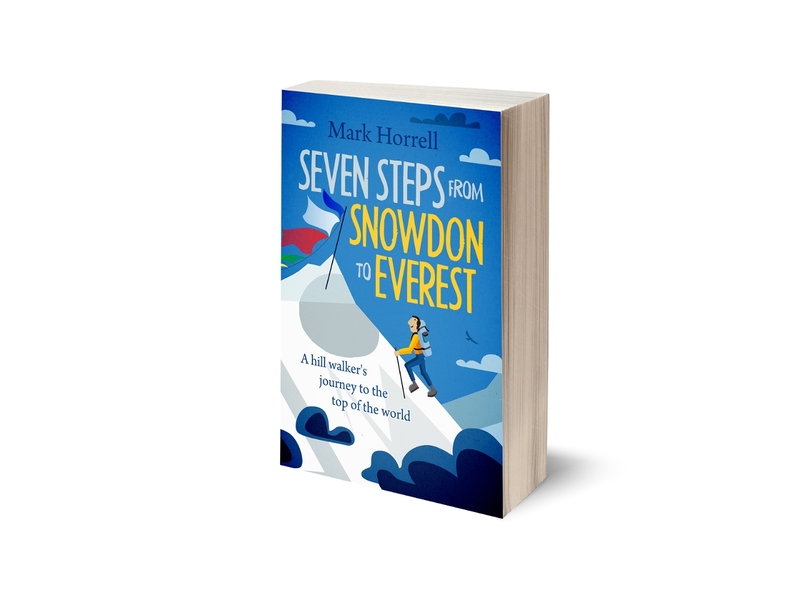 There were no footpaths nearby – we were simply crossing bare hillsides – and she was concerned about whether she would be able to find her way back to her car. I was probably the first person she had seen in hours. But there was no danger of the clouds rolling in today, and we still had plenty of daylight left. I reassured her and passed on. Over the next brow we reached the end of the fells and could see a vast distance. She would have easily been able to pick out her destination, as I could see mine much further beyond. Open skies, wide views and solitude are a magical combination, and this is why these are some of my favourite Lake District hills. 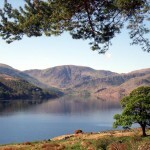 There are some really great fells in Cumbria… I live on the west coast and love it here. Luckily this area (the west) hasn’t been blighted by tourism, so I can go off for hours at a time, on the fell tops and never see another person. The tranquility is out of this world! Thanks, Sean. Yes, you’re right, for some reason I always seem to end up in the east and central fells. Must remember to head your way sometime, especially if as you say it’s much quieter.